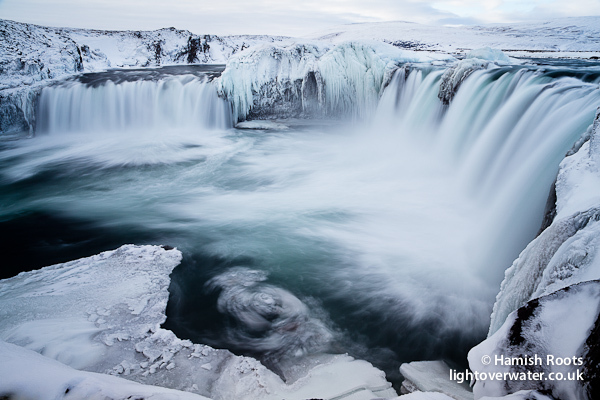 I have just returned from an incredible two week trip to Iceland in winter, exploring both the north and south of the island, and being joined latterly by some clients for a week-long photographic workshop. A lot was seen and photographed. 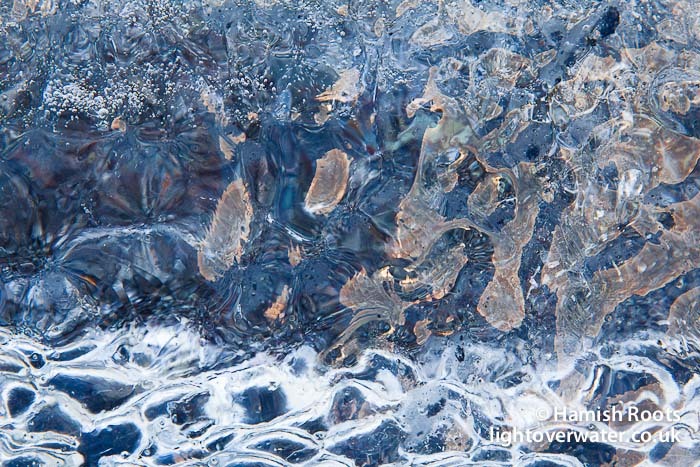 From the smooth shapes and ripples across melting icebergs and snow-swept black volcanic sand to the jagged fringes of frozen waterfalls and lava fields dusted in snow, there were a lot of opportunities for interesting compositions. We even saw wildlife every day in the shape of Orca (killer whales), seals, eagles, ptarmigans and a lot of evidence of arctic foxes – Iceland’s only native land mammal, though we never actually saw one – I’m sure if we were better prepared we could have come back with some images that did them justice too! The conditions certainly played their part in the adventure as we endured bitingly cold temperatures and ferocious winds – which only served to pull the temperatures further thanks to the windchill factor, estimates range from -25C to -30C! Drifts of snow, pushed all the way from fresh falls on mountains and glaciers some miles away, built up at a number of locations we visited making maneuvering interesting. We encountered blinding dust storms crossing the open plains of glacial moraine as strong winds whipped along at over 70kmh, blocking out almost all the light and obscuring anything more than a few metres ahead. Certainly tested the nerves but we got through it fine. After a number of visits to Iceland I have seen firsthand how it undergoes dramatic changes in such short periods of time thanks to the power of the weather conditions it experiences; in one particular location it dawned on us an entire beach had been washed away leaving large exposed rocks some 3 metres or more below the sand level of the beach I walked across only last October. Quite a shocking yet equally fascinating discovery. 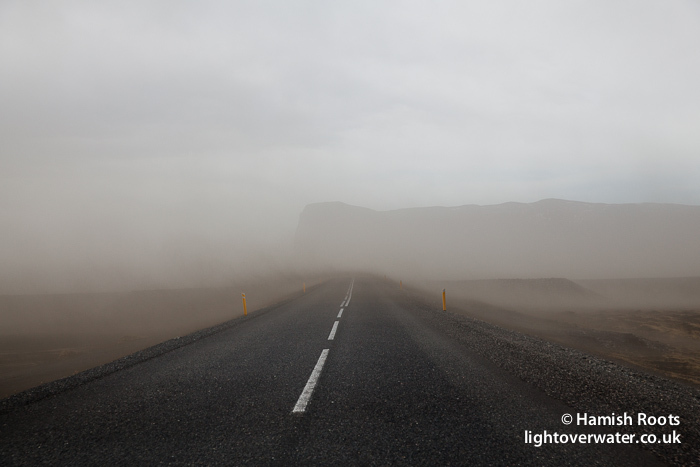 An Icelandic Dust Storm tears across the highway obscuring the way ahead. Despite the occasional adverse conditions and surprise discoveries almost every location played up to and beyond expectations, vast icebergs awaited in the famed lagoon, slowly bobbing about with the rise and fall of the tides. The black volcanic beach neighbouring the lagoon was laden with the jewel-like deposits of ice – large and small – leaving a lot to explore and investigate. We saw the magical northern lights on a number of occasions, it’s ethereal glow stunning the group with every twist and turn they made being particularly bright this time around. By the last day after many miles traveled, several happy clients remained at the end of it, all present and correct (well, at least the same number we counted in, were counted out at the end!). I am very much looking forwards to returning to that incredible country and see more of it, I still feel I have barely begun to scratch the surface – there is a tentative plan to go in summer…watch this space! I have been making updates to my photography facebook page including some images when connection allowed whilst out there, for a day-by-day report please head there. Once I have had a chance to go through the images I will upload them. Denise, thanks for getting in touch. 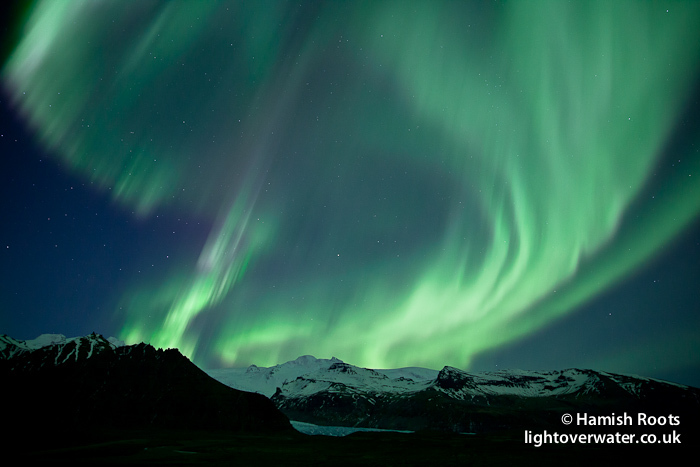 Iceland is an incredible place with so much going on, it’s a shame you didn’t get to see the northern lights when you went in December…but they can be quite fickle, which does make it all the more impressive when they do appear. We are of course at the mercy of the weather – any chance of a cloudy night and you might as well forget heading out and just enjoy propping up the bar! All the best to Oli and his progress on Mariquita with the crew! Having read your blog, I think my resolve to go there in the winters is stronger. I hear that Autumn this year may just be the best time to see the Lights. Fingers crossed I can make it. By the way, did I mention, stunning photos! After reading this I feel I have just relived the experience. What an amazing time we all had. Don’t forget I am interested if you do a workshop in Norway. Give it some thought perhaps?